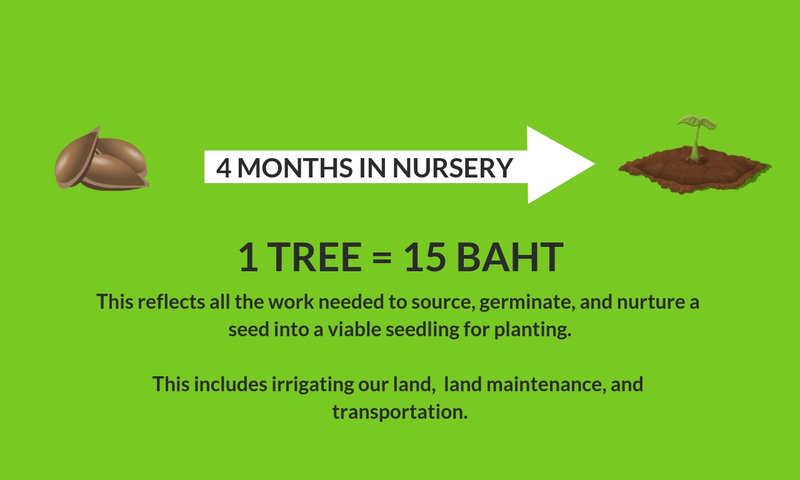 Conserve Natural Forests (CNF) needs your help to meet our goal of planting 1,000,000 native trees in the tropical mountain forests of northern Thailand. Please help us reduce your carbon footprint and restore a beautiful ecosystem! We are a conservation nonprofit – Our mission is to restore ecosystems damaged by human disturbance and rehabilitate critically endangered animal species using practical, proven methods to maximize success rates. We work with local communities to exchange knowledge and raise awareness about environmental conservation. Last year, with a little help from our friends, we planted over 190,000 native trees throughout the Mae Hong Son and Chiang Mai provinces. This would not have been possible without the invaluable support of local communities, including neighbors, the military, university students, primary schoolchildren, and the local government, who help us to restore their land. enough to diminish hope and discourage change. What can be done against such overwhelming odds? One answer: Plant trees! Here at CNF, we believe that every little effort makes a difference. Or in this case, every little tree. With enough trees we have a forest, and forests provide a wealth of critical resources to our world, including medicines, timber, food, and clean water. They also function as carbon sinks, meaning they sequester carbon from the atmosphere and release oxygen back into the air for us to breathe. Carbon is the basis for 50% of the dry weight of most trees spread throughout roots, trunks, branches, and leaves. Every gram of carbon stored in trees as they grow is a gram that is not released back into the atmosphere. And trees are the gifts that keep on giving. If you plant 200 trees, you offset your car’s carbon emissions for the next thirty years. 500 trees will offset your household and your car. Imagine reducing your carbon footprint to zero for decades and restoring a beautiful ecosystem at the same time. 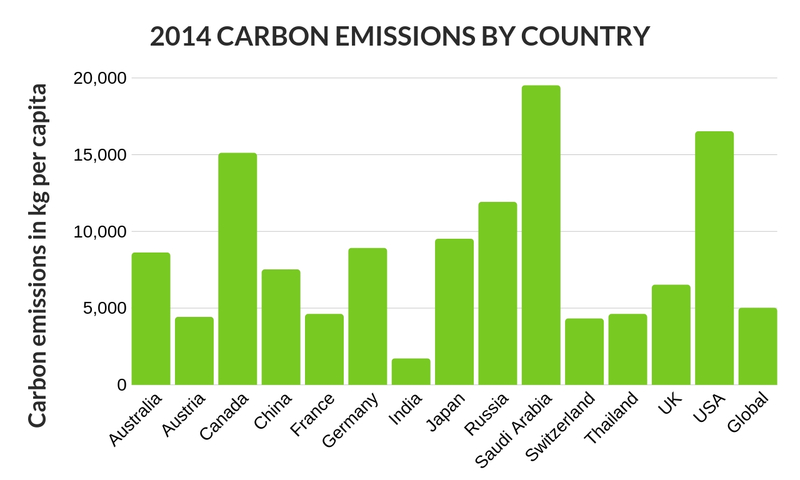 It can be difficult to determine your carbon footprint and the best way to reduce it. We understand how unrealistic it would be to ask people to give up their cars or their homes, to never buy a plane ticket or give up eating meat. While reducing consumption across the board is not only recommended but also necessary, for now the next best thing is to plant trees. 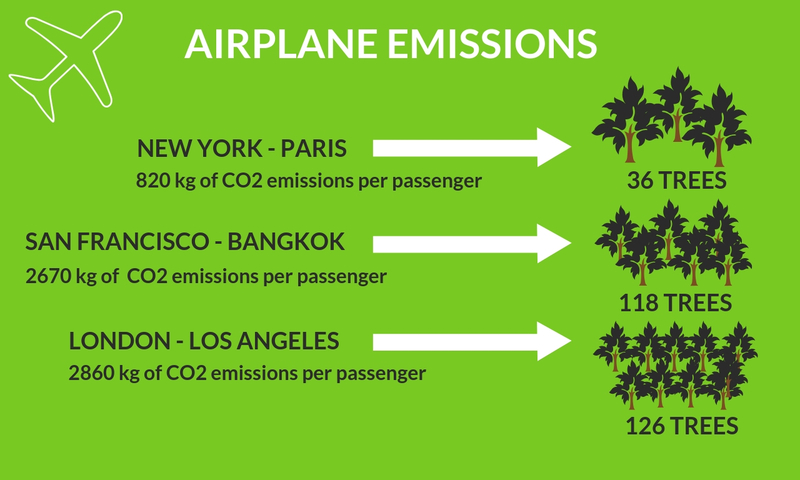 Compiling data from partner organizations and our own research, we at CNF have estimated how many trees you would need to plant to effectively reduce your carbon footprint. When you plant trees, you can have the peace of mind knowing that your car, your household, or even a part of your country’s per capita contribution to CO2 emissions has been brought to balance with a beautiful, natural tropical forest. If you’d like to donate, you can select a preset amount from the list which is based on the carbon emissions of the average person. 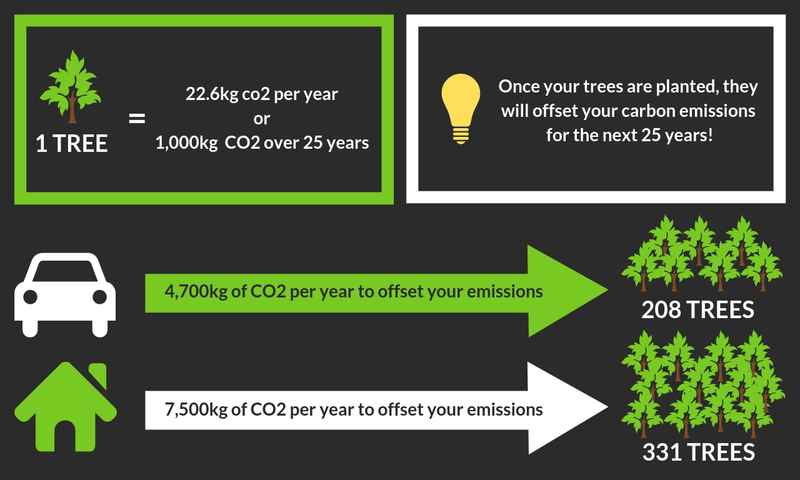 If you’d like to find out exactly how many trees you’d need to plant to offset your annual carbon emissions, you can use the carbon footprint calculator below, and enter your result into our tree calculator. This will tell you how much you need to donate to offset your annual emissions through tree-planting. Conserve Natural Forests is a nonprofit in northern Thailand that seeks to reintroduce captive Asian elephants to protected natural habitats. This keystone species’ reduced presence in our tropical forests upsets the natural equilibrium, contributing to the unchecked growth and spread of dominant plant species and a reduction in overall seed germination and dispersal. Our plan provides a path to reunite elephants with the ecosystems that need them. We work hard to ethically and sustainably relocate females to our project site, where they learn to forage, socialize, and care for themselves in a safe and abundant environment. Their natural habits also encourage landscape succession on our project site through nutrient cycling and seed dispersal. We would like to study the dynamic between elephants and tropical forests in Thailand and contribute practical, valuable data to the limited research currently available. When the elephants are ready, we will reintroduce them to a national park or wildlife refuge.